Too beautiful a morning to stay home, we paid another visit to the Ira Trailhead and its canal boardwalk in the Cuyahoga Valley National Park (CVNP). Birds have finished rearing this year’s young and have scattered, some have begun their migration treks. It was a weekday, during the school term, so the area was nicely quiet. We spotted a tiny heron plying the waters of the old Ohio & Erie Canal. 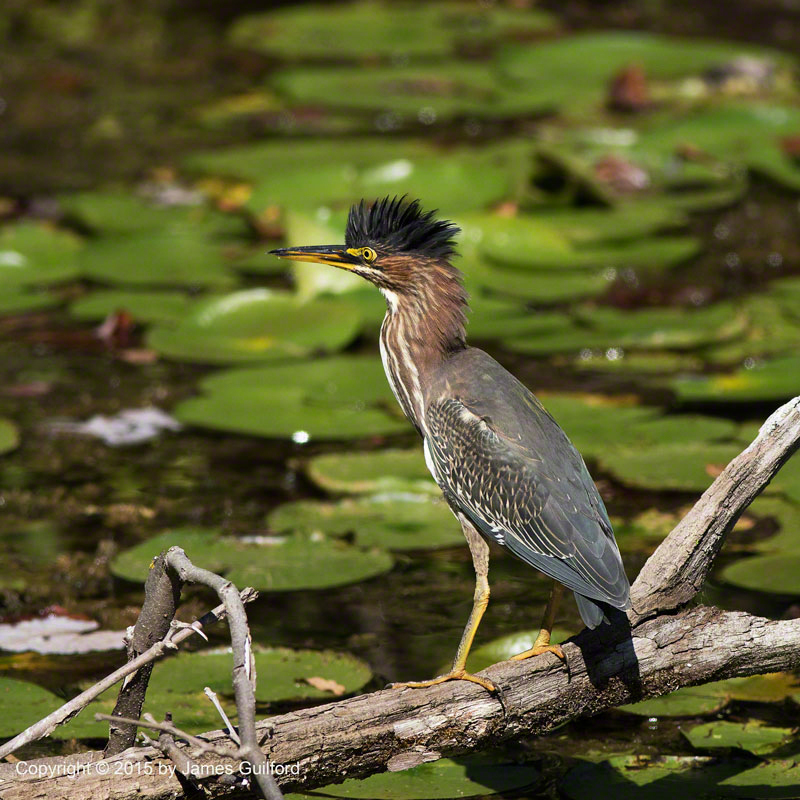 A passerby had said there was a Green Heron just up the path; did they get the ID wrong? The bird was so small! 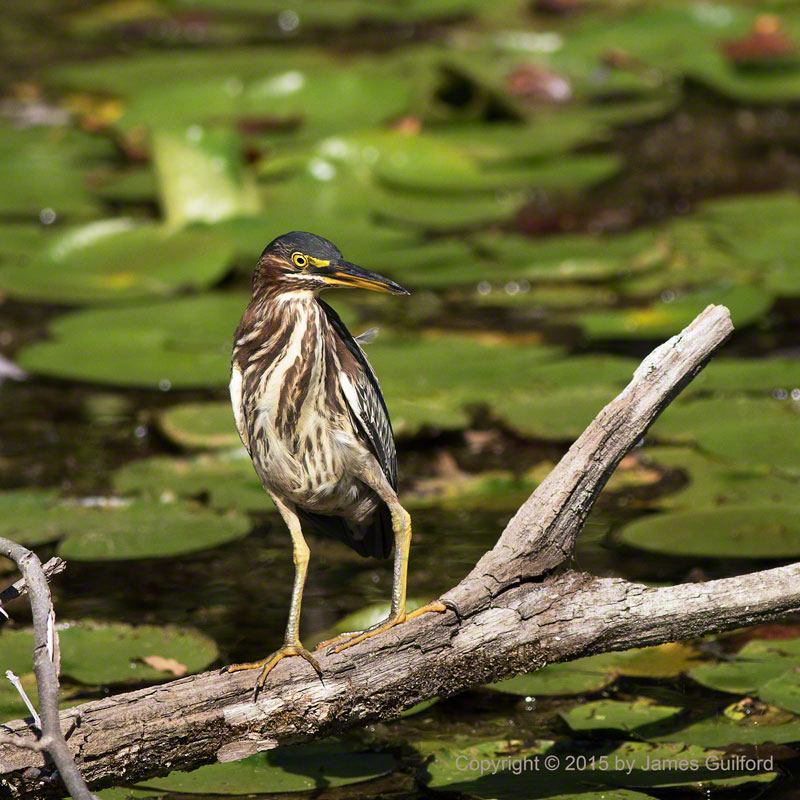 Through the telephoto lenses we could see they were correct… it was a Green Heron all right though it must be a 2015 hatchling to be so tiny. The bird may have been small but it showed the behaviors of an experienced and aggressive hunter as we watched from the path. For the most part, and typical of herons hunting, the bird stood very still and stared at the lily pads and surrounding water; it jabbed once or twice catching some tiny creature for sustenance. Suddenly something on the far canal bank caught the heron’s eye: it stretched out its long neck, jerked its head around, and stood up its crest — the first time I’ve seen such a display by a Green Heron! The crest went down. The crest went up again and our little guy popped into the air, alighted in the water at bank’s edge, and a frog flew off the bank, over the alighting bird, and safely into the water! A missed meal for Green but froggy lives to see another day!